You could hear a pin drop while Richard Archuleta spoke to the 30 + kids at Taos Pueblo Day School. Richard shared educational stories about pollution and stressed the children’s important role as environmental stewards. This was part of a special STEMarts @The Paseo workshop led by Megan Avina Bowers as Paseo volunteer teacher from TISA (Taos Integrated School of the Arts), Leroy Martinez and Marilyn Trujillo, the 5th and 6th grade Day School teachers. Students learned about this years Paseo STEAM Monster Design Challenge and designed native-inspired monsters created with markers, beads and feathers. The monsters are inspired by Paseo’s featured artist this year, Motomichi Nakamura. We shared with the students how the artist is inspired by Japanese Shintu and environmental and cultural explorations of monsters from his homeland in Japan. Richard Archuleta shared with students how Taos Pueblo has its own cultural monsters and encouraged them to be creative and imaginative. They complied! The student entries will be showcased on The Paseo Project website and winning monsters will be curated and projected by Motomichi on to Plaza buildings for the grand PASEO Party on the Plaza event taking place September 23, 2017 7-11pm. The students representing the participating schools are invited to attend the event to learn about projection mapping techniques and interact with the audience. Taos Pueblo and Native American artists from around the country have been participating in The PASEO since year one when Santa Fe artist, Will Wilson brought his installation, The Critical Indigenous Photographic Exchange (CIPX) project. Last year Claireen Espinoza’s class worked with Dine artist, Bert Benally, to create an LED interactive sand painting on Civic Plaza Drive for The PASEO 2016 festival. In the same year Taos Pueblo multi media artist, Robert Mirabal, offered Star Runner, a special fundraiser in the dome in collaboration with 360-degree interstellar visuals by Joe Abraham Dean of Lumenscape. This year in addition to the Taos Day School Monster entries, we have a special performance by Taos Pueblo dancer, CJ Bernal and Ballet Taos. This edgy multimedia genre-smashing new dance troupe in town will be part of the Silent Disco installation. Not to be missed! STEMarts@ThePaseo is supported in part by New Mexico Arts, a division of the Department of Cultural Affairs, and by the National Endowment for the Arts. Additional funding is provided by the Martin Foundation, the Nina E. Nilssen Scholarship Fund, US Bank, GarageCube and Americorps VISTA. The Paseo Project is a 501c-3 nonprofit whose mission is to transform art through community and community through art. Its board of directors includes Joleen Montoya, Liz Neely, Morten Nilssen, Elizabeth Crittenden-Palacios, Molly Robertson, and Janet Webb. Co-directors are Agnes Chavez and J. Matthew Thomas. STEMarts Lab enters its fourth year designing the youth and education program for The Paseo Festival. The STEMarts@The PASEO youth program is a series of educational workshops that go into all Taos County schools, allowing students to collaborate with PASEO festival artists exploring STEM (Science, Technology, Engineering, Math) in their art making process. For the festival, an artist is placed into every middle and high school in Taos. Teacher and students work with the artist up to one week prior and then perform/install their work live at The PASEO event. Students learn valuable STEAM skills through creative expression, social practice and collaboration, and are empowered as their creations become part of a real world event. We believe that the challenge and potential of STEAM education is for all students to have access to the latest technologies and 21st century thinking, especially in rural areas with limited access. The PASEO is the perfect platform for local students to use these tools to play, explore and imagine a better world. For the 2017 PASEO Party on the Plaza interim event we built a unique STEAM Monster Design Challenge around the work of Paseo featured artist, Motomichi Nakamura. This Taos county call for middle and high school student submissions is based on Motomichi’s Tiny People and Giant Monster series in which he incorporates the monster theme as a mythological character to explore environmental issues. Through an online STEMarts Design Tool, workshops and school performances students will have the opportunity to design a STEAM Monster which will be displayed on our website. Winners of the challenge will have their monsters projected on to buildings around the plaza alongside the artist’s work. Based on Motomichi’s work with 2D animation and character design, the participants are creating their own original monsters to submit by September 15, 2017. All the entries will be showcased on the Paseo Project website and the best entries will be curated and projected on to plaza buildings by Motomichi for the Party on the Plaza event. Students are invited to assist the artist with the projection installation stations to learn the technology behind projection mapping and explain the project to the audience. What happens when a physicist from CERN, a Lakota water protector, a Tewa educator and a new media artist meet with 26 Taos fourth and fifth graders? Perhaps, opposing worldviews will converge to create a new balance in the universe! The two-day workshop is part of the Projecting Particles Project, introduced during The PASEO 2014 – which also included a virtual collaboration with Dr. Goldfarb and the ATLAS Experiment at CERN. Now Dr. Goldfarb will appear in person to explain the Large Hadron Collider, the largest particle accelerator in the world, and how it is used to discover particles that are the key to our understanding of the universe. With Standing Rock water protector, Steve Tamayo, students will learn the indigenous way of using science to relate to the physical world. 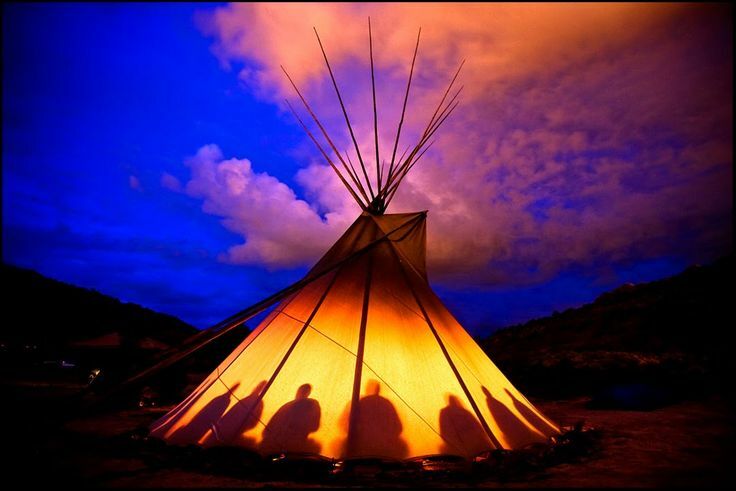 The students will participate in the building of a Lakota tipi as they hear metaphorical stories that share the cosmological observations of indigenous peoples. Guided by the research and wisdom of Dr. Cajete, the interdisciplinary team will encourage youth to imagine a new worldview that combines science, technological and life-sustaining ecology that is in balance with nature. 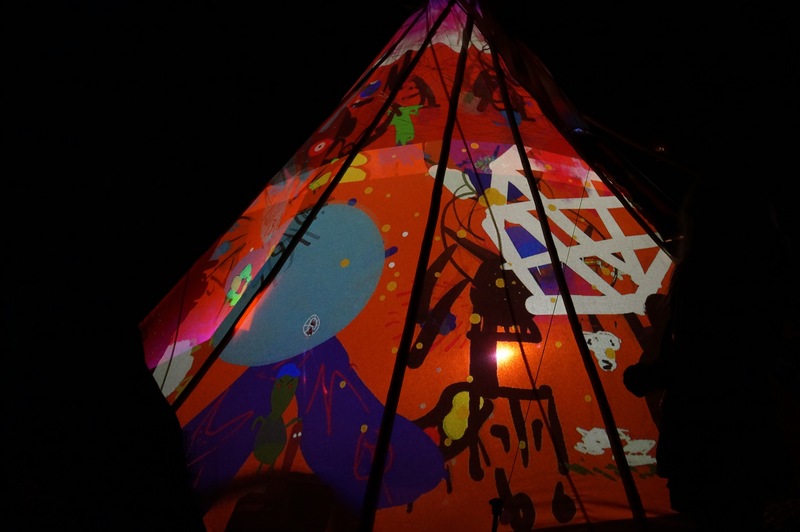 With artist Agnes Chavez, students will transfer their newly created stories into animated electronic graphics to be projected inside of the tipi, creating an installation that they will share with the community at a live performance on April 11. 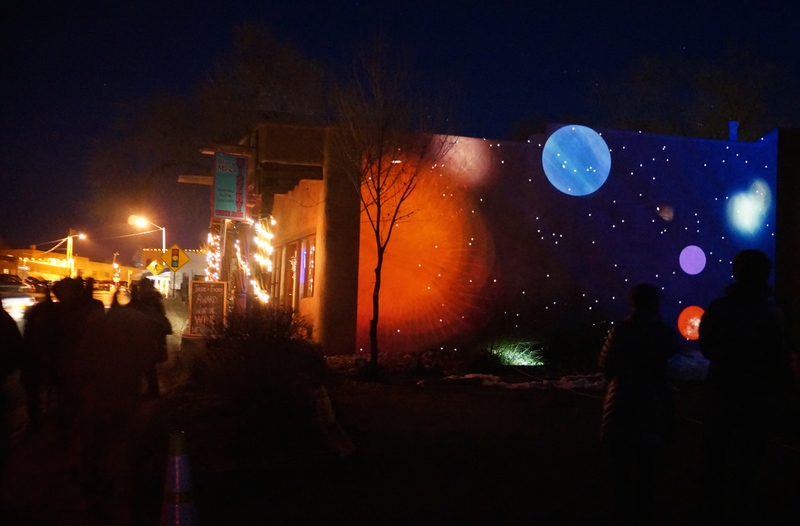 Chavez will be assisted by three Taos High School students, all of whom have participated in past Projecting Particles workshops where they learned the Tagtool animation tool from Paseo artist and Tagtool app developer, Markus Dorninger. The public will be able view a video documenting “Lakota Cosmology Meets Particle Physics” in three different roundtable discussions – in Taos, Espanola and Santa Fe. Dr. Steve Goldfarb is a physicist from the University of Melbourne, working on the ATLAS Experiment at CERN in Geneva Switzerland. He is active in education and outreach, is the webmaster for the ATLAS public web pages, co-chair of the International Particle Physics Outreach Group, on-site coordinator of the REU Summer Student and Research Semester Abroad programs for American undergraduates at CERN, and advisory board member for Quarknet. Steve Tamayo is based in Omaha Nebraska. He draws upon his family history as a member of the Sicangu Lakota tribe. His fine arts education (BFA from Singe Gleska University) along with his cultural upbringing have shaped him as an artist, historian, storyteller and dancer. Steve provides activities during his residencies that include art and regalia making, drumming, powwow dance demonstrations and lectures on the history, symbolism and meaning behind the Native customs and traditions. 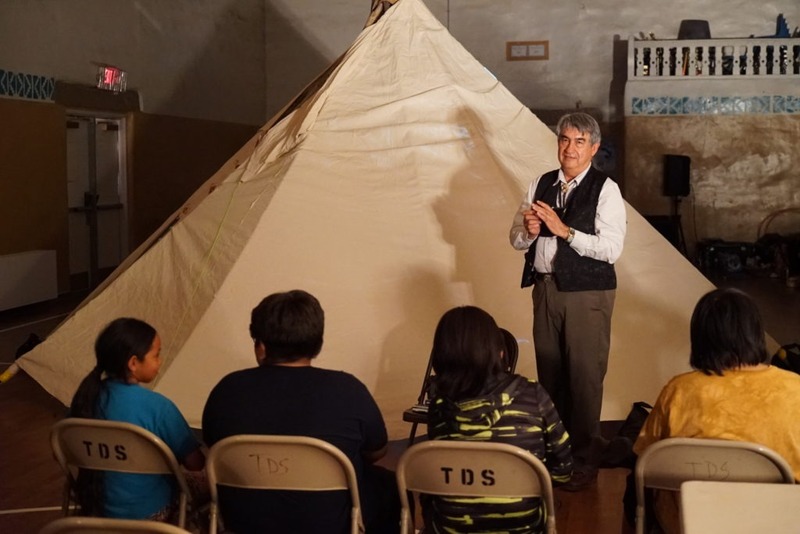 Most recently Steve led workshops with kids at Standing Rock Oceti Sakowin Camp. Dr. Greg Cajete is a Native American educator whose work is dedicated to honoring the foundations of indigenous knowledge in education. Dr. Cajete is a Tewa Indian from Santa Clara Pueblo, New Mexico. He has served as a New Mexico Humanities scholar in ethno botany of Northern New Mexico and as a member of the New Mexico Arts Commission. Dr. Cajete has authored five books: Look to the Mountain: An Ecology of Indigenous Education, (Kivaki Press, 1994); Ignite the Sparkle: An Indigenous Science Education Curriculum Model, (Kivaki Press, 1999); Spirit of the Game: Indigenous Wellsprings (2004) , A People’s Ecology: Explorations in Sustainable Living, and Native Science: Natural Laws of Interdependence (Clearlight Publishers, 1999 and 2000). Agnes Chavez is a new media artist and educator and co-director of The Paseo, working at the intersection of art, science, technology and social practice. She partners with scientists and programmers to explore our relationship to nature and technology through data visualization, sound and projections. Her recent installation, Origination Point, visualized the origins of matter and the Higgs Field, informed by a research stay at the ATLAS Experiment at CERN in 2015. Agnes is Co-Director of The PASEO, the outdoor participatory arts festival which brings projection, performance and installation art to the streets of Taos, New Mexico. In 2009 she founded the STEMarts Lab, which empowers youth through STEAM workshops that integrate science, technology and new media arts through social practice. Megan Bowers Avina Is a nationally award-winning photojournalist and artist who has lived in Taos for over 20 years. Avina is the Art’s Curriculum Coordinator at the Taos Integrated School of the Arts and fourth grade teacher. Avina strives to create a classroom atmosphere of real world issues to inspire her students to become critical thinkers and instruments of positive change in their community/world. Avina is a graduate of Parsons School of Design and is currently obtaining her Masters of Fine Arts at UNM. Avina is ecstatic to have joined forces with Chavez in bringing an amazing curriculum to the students at the Taos Integrated School of the Arts. Thanks to sponsors TISA and a grant from the Martin Foundation, ATLAS Experiment at CERN, Harwood Museum of The Arts, Taos Youth and Family Center and Northern New Mexico Community College. A visit to the Oceti Sakowin Camp at Standing Rock has inspired a new STEAM curriculum for youth. Through a multicultural collaboration with indigenous educators, artists and particle physicists students will explore the correlations of indigenous cosmology to modern science through art and social practice. The curriculum will focus on our human connection to nature, science and technology through diverse worldviews. 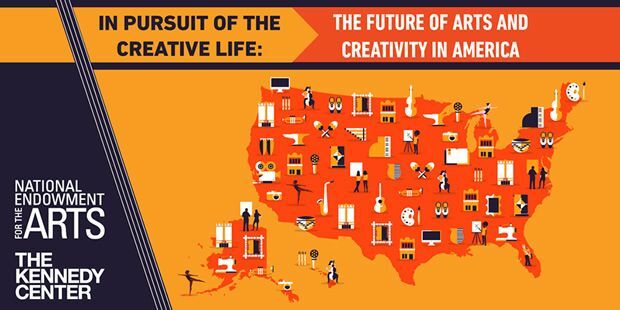 As an artist and Americorp VISTA working at the intersection of art, science, technology and education I focus on youth, inspiring them to discover who they are and their connection to their community and the world. So when I heard that Standing Rock was started by youth, supported by elders and sustained by over 300 tribal nations and countless activist organizations from around the world, I felt called to action. When I got there elders told me they felt it was their prayers calling people. I believe that Standing Rock is an important and transformational movement. I wanted to go in person to meet and support the youth leaders from the International Indigenous Youth Council (IIYC) and I had heard from Taos Pueblo drum maker, Christopher Lujan that someone had started a school at the camp for the over 200 kids living there. So I got together with Chris , Jason Rodriguez of ARTAOS and teacher, Megan Avina Bowers at TISA (Taos Integrated School of the Arts) and we designed a workshop for the kids which resulted in student-created banners which I delivered to the young water protectors. They were so open and appreciative of this gift from the kids that they even took the time to record a video message for them. What impressed me most is that they are not just fighting the pipeline, they are focused on the idea of building a Just Transition Community grounded in prayer and modeling to the youth a new way to be in this world. I saw how they were focused on educating and raising awareness to the change that needs to happen to protect our natural and cultural resources for future generations, while understanding the important connection between ecological diversity and cultural diversity. The media has not been covering this story, so the youth have taken to Facebook live streaming, drone footage from the front lines, and creating YouTube videos to communicate their message. The youth of Standing Rock are using the new Facebook live stream technology and free social media platform to shake up the world and I came back wanting to continue this work in our schools and communities. While there, I met Steve Tamayo, one of the Lakota teachers at the Oceti Sakowin school managed by Teresa Dzieglewicz who was living at the camp. Steve was sharing Lakota traditions while teaching kids how to build a Tipi. I told him about a project I started in 2009 called Projecting Particles, collaborating with scientists at CERN, home of the particle accelerator in Switzerland. The workshops combine projection art and particle physics to explore new understandings of the universe. We saw some fascinating correlations between traditional Lakota cosmology and modern particle physics. We are now collaborating with CERN physicist, Dr. Steven Goldfarb, to design a curriculum that explores these correlations through STEAM youth projects and a community lecture series. We hope that increasing understanding of radically new science concepts while building appreciation for the significance of indigenous cosmology and worldview can provide students with a meaningful, collaborative and unifying way to explore and understand the world around us. Follow this blog to see how this project evolves. Two years ago I joined artist Andrea Polli and the Social Media Workgroup (SMW) as an Americorps VISTA. “Did you know that President Kennedy introduced the idea of VISTA to Congress in 1963? Or that many of the best-known anti-poverty programs, including Head Start and Credit Unions, were expanded by VISTA members? VISTA has been on the forefront of ending poverty in America for 50 years.” Check out the Americorps VISTA website to read more about this important program. In 2014, SMW received its first Americorps/VISTA grant to launch the STEAM NM initiative: Building Capacity for STEAM (Science, Technology, Engineering, Math and the Arts) Education in New Mexico. Now renewed and expanded for its third year with VISTA, our STEAM NM core group includes SMW along with five partners: UNM STEM Collaborative, The School of Architecture + Planning and COSMIAC; the CNM Fuse Makerspace, and The PASEO/STEMarts in Taos. My role as the Taos VISTA is to innovate and network STEAM initiatives in Northern New Mexico. It has been an exciting year that has led to new local and global partnerships to expand youth opportunities in our communities. Read more about it on the Social Media Workgroup website and stay tuned for 2017 programming. A Spring 2017 workshop called Particle Physics Meets Lakota Cosmology is currently being designed for students at Taos Integrated School for the Arts (TISA) and we plan to take the workshop to multiple schools in New Mexico. Through a collaboration with Lakota Cultural Specialist, Steve Tamayo and CERN physicist Dr. Steven Goldfarb, students will explore the origins of the universe through Native American cosmology and particle physics experiments at CERN. This project is part of the Projecting Particles series whose mission is to use art to explore the important discoveries in particle physics that are expanding our understanding of who we are and our place in the universe. Students learn about the origins of the universe through particle physics and participate in a virtual tour from the ATLAS Experiment in Geneva Switzerland, led by CERN physicist Dr. Steven Goldfarb. They then participate in a hands-on Tipi making and Dreamcatcher workshop with Lakota Cultural Specialist, Steve Tamayo to learn about Lakota cosmology. Students create stories that explore their micro-macro connection to the universe and the stars, correlating physics concepts to the big bang, black holes and constellations. 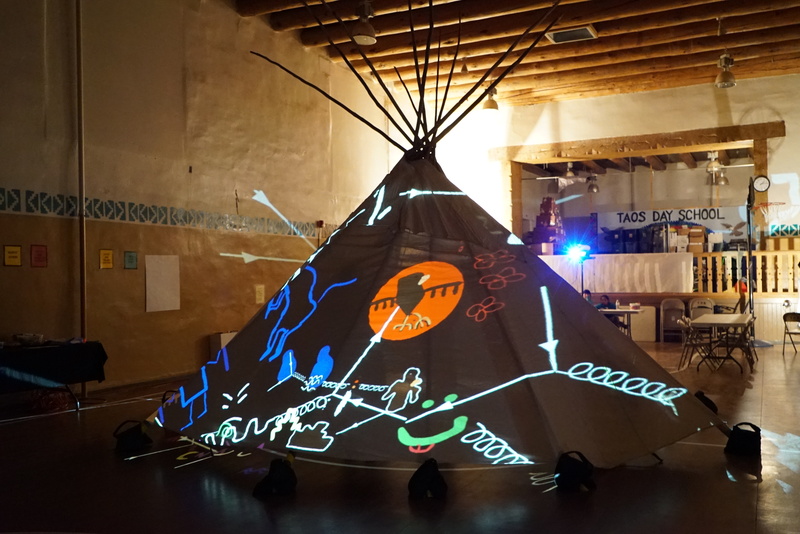 Finally they learn projection mapping with Agnes Chavez to animate their stories with light on to a 24′ Tipi, and share their work with the community through a public event. We are living in what is now being called the ‘Golden Age of Cosmology’ and cutting edge science and technology is revealing expanded understandings about ourselves and our universe that converge with indigenous cosmology. Exploring the correlations of indigenous cosmology to modern science through art making is a powerful way to increase understanding of radically new science concepts while building appreciation for the significance of indigenous cosmology and worldview. I am currently working with Steve Tamayo and Steven Goldfarb on the curriculum design. Follow this blog for updates and please contact us if you are a school interested in this workshop. As part of TISA’s new STEAM Lab, Amber McCabe’s 8th grade class participated in an Augmented Reality (AR) Mural Work/Study Project providing real-world community focused learning of STEAM skills. AR is a live direct or indirect view of a physical, real-world environment whose elements are augmented (or supplemented) by computer-generated sensory input such as sound, video, graphics or GPS data. Information about the environment and its objects is overlaid on the real world. This exciting semester long project inaugurated spring 2017 and is now open so stop by for some augmented reality and frozen yogurt! Co-founders, Bowe Ellis and Steve Kennebeck are the founders of Ziggy’s, a new froyo shop in Taos (Next to Taos Java) and approached me to see if STEMarts Lab could coordinate students to paint a mural for the shop. STEMarts Lab brings artists into schools through interdisciplinary collaborations that integrate art, science, and technology through social practice. For this project, we brought in artists, Jason Rodriguez and Aya Trevino of ARTAOS who had been exploring AR technology to work with the TISA kids. They worked with Ziggy’s owners to design the interior space of the new frozen yogurt store and engaged students in the process. Students helped to design and create an Augmented Reality (AR) mural that makes the whole space interactive. By pointing your smartphone or iPad at the painted mural on the walls, animated images pop off the wall for a fun and surreal 3D experience. The main star of the mural is Ziggy, the adorable pug of owner, Bowe Ellis. Yogurt will never be the same! In line with TISA’s ‘Design Thinking‘ methodology, students were involved in all aspects of the production, from visiting the space and meeting the “clients”, to developing the concept, to designing the technology that creates an augmented reality experience for visitors. Through this project students understand the impact that art, science, and technology can have in our society and our community. The AR Mural project aligns with Core Arts standards, 21st Century standards and the Next Generation Science Standards. Design and critical thinking skills to explore new approaches to image making, including designing stencils and laser cut vinyl patterns. Collaboration with UNM Digital Media facilitators, Peter Walker and Enrico Trujillo, and their art students to access advanced technologies to realize their ideas.i.e. 3-D animation and green screen video making. Building of scale model of site to consider floor, ceiling, counters, safe zones, etc. 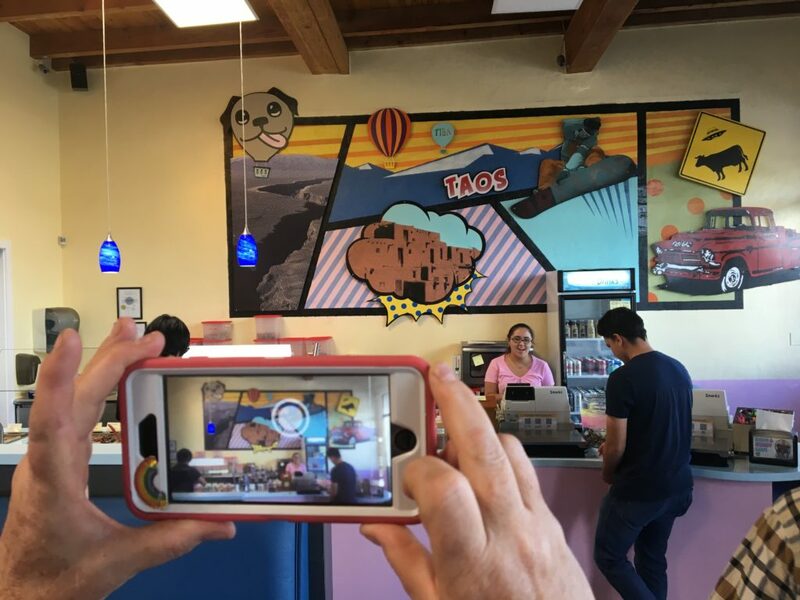 This TISA project was made possible through a partnership with ARTAOS, Ziggy’s Yogurt Shop founders; Bowe Ellis and Steve Kennebeck, and a Paseo Project collaboration with UNM Digital Media Arts. Augmented Reality for K-3rd graders! TISA K-3rd grade teachers also got in on the action! Through a series of professional development sessions we trained the TISA teachers on how to use the Quiver app to delight their students with the magic of AR at an early age. Kids hacked the coloring pages to discover the trigger and overlays and then integrated them into paintings and sculptures to learn how to design with the virtual and real. The teachers shared what they learned at the Twirl Invent Event with an AR station of their own design. We are excited to announce that the launch of a STEAM Innovation Lab at the Taos Integrated School of the Arts in Taos, New Mexico is underway. STEMarts Lab founder, Agnes Chavez, is working with Richard Greywolf and Megan Avina Bowers to design a STEAM Lab that will launch TISA students and teachers into the 21st century. The Lab will be based on the STEMarts Lab model developed in 2009 and which has been implemented through multiple platforms, from new media art festivals such as ISEA2012 Machine Wilderness and The Paseo, to national and international science events, such as the Los Alamos STEM Challenge and the ATLAS@CERN Projecting Particles project. For the past three years TISA has participated in the STEMarts Lab youth program@The Paseo Youth program where students have gotten a taste of this unique STEAM approach. 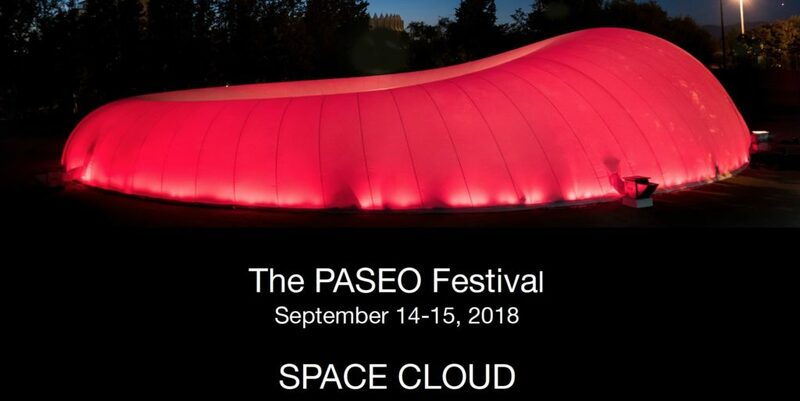 They experience cutting edge technologies and science through the lens of new media artists, and collaborate with the artist to create participatory art for Taos’ exciting new festival, The Paseo. In 2015, NY based artist, CHiKA, engaged students in a video mapping marathon that was part of the festival and this year students worked with The Illuminator, an art collective that works with light projections as a means of political expression, environmental transformation, and public discourse. We will integrate an ongoing series of Projecting Particles workshops in collaboration with ATLAS@CERN that will keep students abreast of the latest discoveries in particle physics, and through art, better understand how these discoveries expand our understanding of who we are and our place in the universe. We have partnered with TWIRL to integrate their exciting STEAM activities, and are looking forward to collaborating with other emerging Maker spaces and activities to create a community-focused laboratory for exploration. The STEAM Innovation Lab at TISA will continue to offer these unique interdisciplinary collaborations but will also provide teachers with year long opportunities to learn about and integrate cutting edge technologies into their own curriculum topics. Some unique features of the Lab include, A 21st Century Materials and Resource Library, a multi-functional space that allows for multiple intelligence exploration, and a VR biofeedback room that focuses on social emotional intelligence. The TISA STEAM Lab will have a strong emphasis on science concepts, creativity and innovation, personal reflection and growth, and social practice as the foundation to all technological explorations. For more information contact learn@sube.com.